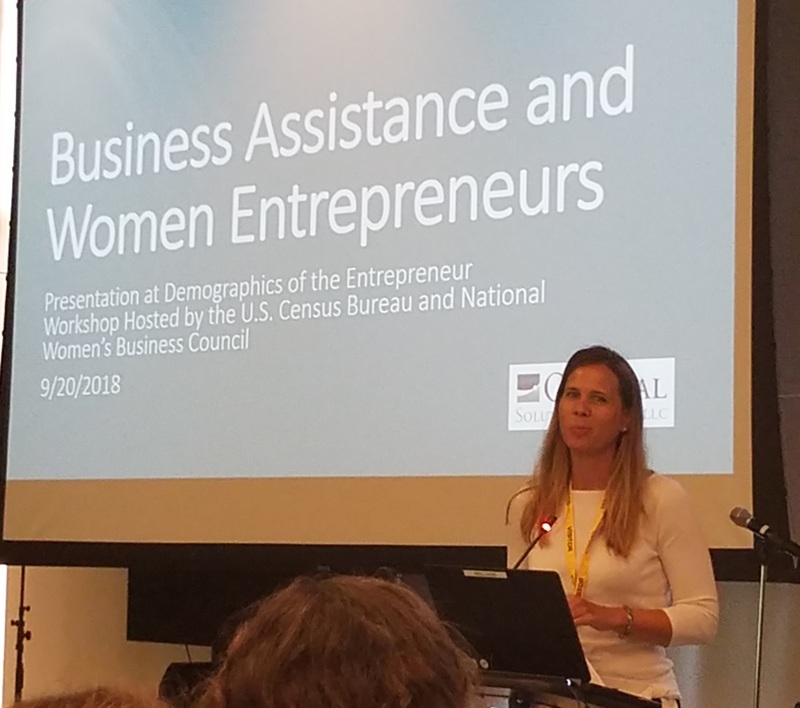 Dr. Jennifer Auer of Optimal Solutions presented a paper, “Business Assistance and Women Entrepreneurs” at the Demographics of the Entrepreneur Workshop on Sept. 20, 2018. The paper — authored by Optimal employees Dr. Auer, Dr. Andrey Vinokurov, and Michael Bacas — and presentation explored questions of whether federal and local business assistance programs offered to entrepreneurs in all 50 states meet the needs of women entrepreneurs, a vital topic given the recent growth in women-owned businesses and the importance of women entrepreneurs for broader economic growth. The study posed three questions: Do women engage in entrepreneurship for different reasons than men? Do women seek business advice for different reasons and from different sources than men? Do women perceive the effectiveness of assistance, advice or mentoring more differently than men? The findings, obtained by analyzing the Census 2016 Annual Survey of Entrepreneurs (ASE) and the Small Business Administration’s 2016 Women’s Business Center (WBC) client outcomes survey, suggest there are substantive gender differences in reasons for seeking business assistance and the sources of assistance sought. However, there were no gender differences in the perceived effectiveness of the assistance, advice or mentorship. Although most of the results on gender differences were congruent with the literature, the discrepancies point to the diversity of experiences of women entrepreneurs, likely reflecting a complex interplay between the individual, social, community, and societal factors affecting women’s entrepreneurship and business growth. Auer further discussed the findings’ implications for women-focused business assistance and future demographic-focused research. The workshop was hosted by the Census Bureau and the National Women’s Business Council. Dr. Jennifer Auer presents findings on women’s entrepreneurship at the Demographics of the Entrepreneur Workshop in Suitland, Md.